"My good friend Pat gave me this recipe. I make it every week. It is healthy and fills you up. Use whatever frozen fruit you like. You can also add fresh fruit. Can be served with milk or ice cream for breakfast or a treat." 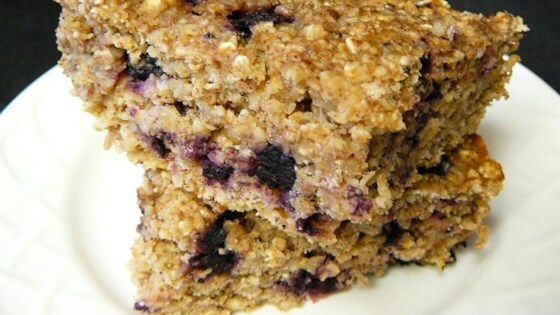 Mix oats, eggs, blueberries, applesauce, brown sugar, skim milk, flax seed meal, wheat germ, baking powder, cinnamon, vanilla, and salt together in a large bowl; pour into a 9x13-inch baking dish. Bake in preheated oven until the moisture is absorbed and the oats are tender, 25 to 32 minutes. You can cool the oatmeal and cut into squares, making it easier for refrigerating and having on hand to eat later. Taste wasn't bad but it is too wet. Excellent with blackberries. If refrigerated, microwave 30 seconds before eating. Very easy to make, my kid (2&4)gobbled it up. I would do a 1/2 portion next time, as it makes a ton. Great for a bruch too! Excellent. I added chopped apple and some melted butter. Yum.